Android device users who run Google apps on devices that are not certified by Google receive "Device is not certified by Google" messages when they attempt to open Google applications such as Google Maps or Gmail on their devices. Google Apps refers to a set of applications that most Android devices come with automatically; affected users can't access any of these apps, Google Play store for instance. While it is still possible to install Google applications on blocked Android devices, it appears that they refuse to work properly on affected devices. A report on the XDA Developers forum suggests that the change happened on March 16, and that any build made after that date is affected by the change. The change affects users who run custom ROMS and any device that did not go through the certification process. Google appears to maintain a whitelist of custom ROMs, however, so that users who run these don't have to go through the whitelisting process described below. Android users can manually register their devices to get it certified. This appears to be the only option right now for users who are affected by the change. Some users commented that their uncertified device is not -- yet -- affected by the restriction. Update 5.4.2018: Google removed the 100 device limit. The form furthermore accepts the Google Service Framework (GSF) ID which you can look up using a program like Device ID. Update: It appears that Google expects the IMEI and not the Android ID despite stating that it wants users to enter the ID on the registration site. To get the IMEI, open the dialer on the phone and use the buttons to type *#06#. The IMEI is displayed on the screen after the last character. The very first thing that you need to do is look up the Android ID if you don't know it. Note that the Android ID may change if you install a new ROM or make other changes to the device. Use an application like Aida64 to look up the Android ID; you find it under Android after installation. If you can't use Google Play to download the app, try third-party stores or APK Mirror. Once you have the ID open the following Google page to register the device manually. Note that you need to sign in to a Google account and that the system limits registrations to 100 devices per user to avoid abuse my manufacturers. Tip: Titanium Backup can restore the Android ID on a device. The short answer is control. Manufacturers could load Google applications on their devices without certification in the past and these apps would work just fine. Google changed this so that the company's applications won't work anymore on uncertified devices. Don't install any Google apps on the device. Get certification for the device to ship the device with Google apps preinstalled. Certification comes with a list of requirements that may change between different Android versions. It requires, for instance, that the minimum diagonal size of the device has to be at least 2.5 inches, must include a guest account, and use specified parameters when building the operating system. Now You: Are you affected by the change? What's your take on it? Is the disallowance to use the Google Apps a feature of newer Google Apps? Can one still use older versions of the Google Apps, without going through the certification or having the certification? I would imagine that one may also try to emulate the certification status to the Google Apps. 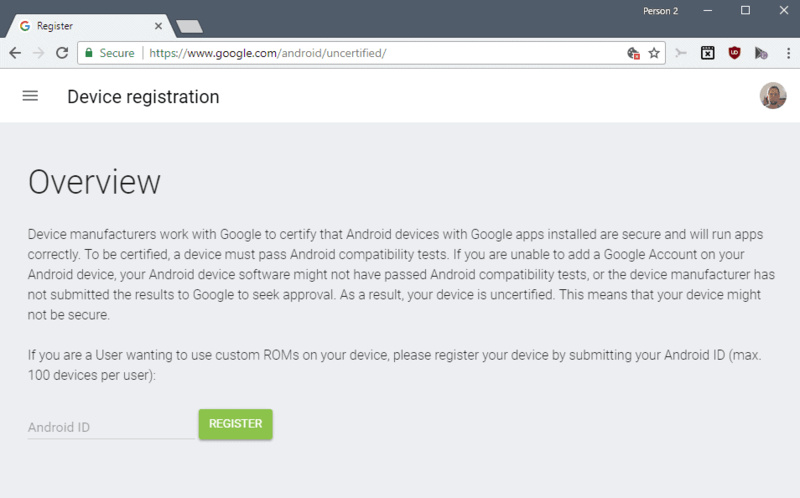 google expects the IMEI, not the “android id”, despite what it says on the registration site. I went to the Google page, typing the url manually. The short answer is control. I think the days of non-personally-identifiable-information are over. However, the problem with tech companies having user information – and the ability to track users – can be seen in the dance Zuckerberg is doing right now trying to avoid questioning about the Cambridge Analytica mess. The governments of both the U.K. and U.S. want to talk to him – and he doesn’t want to talk. These companies could be forcing governments to legislate control over them. Well, yes and no. I use a custom ROM and so this might technically affect me. However, the only Google app I use is Maps — and if that stops working, it’s not the end of the world. There are several alternatives that are nearly (but not quite) as good. My take on it is that anything that discourages people from using Google services is a good thing. This would qualify. That’s my opinion too. This actually just makes it more likely that I’ll cut whatever remains of the “Google tether” in my life. Out of curiousity, can you or anyone else recommend a replacement for the traffic feature on Google Maps? Using Android devices and “cut whatever remains of the “Google tether” in my life” is a contradiction. Well fine, ilev, you are more than welcome to that opinion. But I’m more interested to know if you have an answer to my question about Google Maps. No, it’s really not. It is 100% possible to use Android devices that never interact with Google at all. Lots of people do this. If Google is using IMEI to keep track of how many installs you are doing, then what happens with non cell devices like tablets or TV boxes? I have a few android tv boxes which for sure aren’t certified by Google and just yesterday I did a full flash on all of them, wiping the whole partition before doing it and I still yet to have this “issue”. Not affected as I’m clinging to my unregistered, stupid, pay-as-you-go flip phone. My take is this is a carrot and stick attempt to coerce more people into the Googleplex. The stick is, you can’t use our apps any more. (Oh the horror) The carrot is, sign up and you may continue to use our data slurpers. While this doesn’t effect me, as I review the apps I have installed (and the gazillion of other apps I’ve installed in the past), I realize one thing… I have no killers apps. In fact, I have nothing on my system that’s a must have. I’ll go further… the apps I use daily could all be dramatically improved – this is doubly so for the 4-5 browsers I have on my system. I’ll go even further… there is nothing on my device that produces content (except for the camera/video). All other apps are for pure consumption – like sugar… empty calories. If the app store disappeared for me tomorrow, I would segue into f-droid (which I’ve done for some stuff) and 3rd-party store (for highly selective software). A problem is that the U.S. adopted out-out rather than opt-in, catering to business rather than to the citizens who ended up being harmed by this stuff. The businesses made scads of money and grew like crazy. Same in the U.S. with billboards and even gun control – business interests trumped citizens’ interests. Thank you, legislators. Opt-out is not “capitalism”. That’s a completely lazy interpretation. Opt-out is just a case of governments favouring corporate interests over consumer interests. That happens under other socio-economic regimes too. It’s unrestrained capitalism, and as Adam Smith argued, unrestrained capitalism will always devolve into monopoly. Glad I can’t remember why I once wasted so much time and effort using custom ROM’s. Who cares? I don’t use Google services at all. Moreover, I have already disabled all Google apps on my phone (including Play Store). Because I hate when something that I don’t use is running in the background (including automatic updates). I also hate software as a service concept. I’m willing to use only the apps that are fully featured offline apps. And I sideload apps (I download .apk files from any website except Google Play). If I want to watch YouTube I open it in the Firefox for Android browser. don’t be evil my f****** a$$. I started out with the org droid (motorola A855) and it was refreshing, the freedom was so nice I hosted roms (multi TB of bandwidth a month) for many droid devs including some very well known ones. now…..w/o screwing up device its hard to root (locked bootloaders) and if you do theres always something that don’t play nice. Why do we need apps at all? If you think about how software has been distributed in the past (CD / DVD, downloads / app store etc.) the only reason this was required was because the download speed for using the software was too slow to do on a per usage basis. Thus an installation was required to load quicker. However, the newer wireless technologies are so immediate with installation that the idea of installing an app is fast becoming obsolete. If you can download whole apps in a matter of seconds then just make it a web page on a web site – you’ll never have to worry about being up to date as it is always up to date, and it doesn’t matter what device you are using which is easier from a developers perspective. All you really need is an operating system, a modern browser and a fast connection – we’re already streaming music and video. Why not just extend that to apps that run at source on a web page? A lot of apps are just glorified web browsers anyway with a lot of the functionality stripped out of them and customised to the requirements of the developers. If you can stream a game in real time with little or no latency so that it is undetectable to the user then surely the same is true with less demanding apps. The only reason for apps still being used is due to Google and Apple who get to control what goes on their platforms along with phone manufacturers who to up sell their products with more memory / faster processors etc. Well you will keep buying them, so they’re not going to stop selling them!! The reality is there is no reason that a medium specced phone / tablet could not use VNC to access any platform – be it Android, macOS, Windows, Linux…. whatever. Apps are obsolete. Personally, web apps are not acceptable to me for a whole bunch of reasons. If there’s not a standalone app available, then that functionality is not available at all, as far as I’m concerned. not sure but possibly app based is only way to auto update? as well as ability for app purchesed once to be installed on multiple phones by same user name? don’t have issue with app store really (and I do use f-droid also) but the ability to puch app to multiple devices is useful. still, they are getting closer and closer to a walled garden.